"All the scars of losing those finals stay with you for a very, very long time. They creep up on you in your mind when you least expect it." "The scars never leave you" - As a man who suffered five Grand Final defeats in succession, two NRL Grand Final defeats and a World Cup final loss, James Graham is uniquely placed to pass comment on sporting heartbreak. The 33-year-old Liverpudlian spent nine seasons with boyhood club St Helens in Super League before departing for the NRL and Australia in 2012. There, he represented the Canterbury Bulldogs for six years, before moving to St.George Illawarra Dragons ahead of the 2018 season. On Saturday, Graham will be a studio guest of Sky Sports Rugby League at Old Trafford for the 2018 Grand Final between Wigan and Warrington. It's a setting he's experienced a wealth of sporting pain at before. Between 2006 and 2011, Graham was part of a St Helens group which made a phenomenal six consecutive Grand Finals. Having tasted glory in 2006 though, Saints lost the next five on the bounce - four times to Leeds, once to Wigan. "It doesn't get any easier," Graham says. "All the scars of losing those finals stay with you for a very, very long time. "They creep up on you in your mind when you least expect it and you think to yourself: 'What if?' or 'if only' and all that sort of stuff. "You look back and some of those defeats you think: 'We probably should have won'. Most of those defeats were against Leeds and they obviously created a big history with what they did, but for us at St Helens we probably look back at it as a group and there's a lot of what ifs and thinking about the bounce of a ball. "I remember the particular one in 2011, injuries got to us and we just ran out of players. Three of our outside-backs went off with injuries. We had the game and then we just didn't have the people in the right positions to see it out. "But that's sport and that can happen. You look back at it and think about what you could have done differently to get a medal and lift a trophy instead of watching someone else do it. "The scars never leave you." Warrington head to the home of Manchester United on Saturday looking to avenge their own Grand Final pain and snap a 63-year wait for a domestic league title. Three times in the last six years the Wolves have made the trip along the M62, three times they have headed back as runners-up. To get to this stage, Steve Price's men had to travel to face Graham's old side St Helens in the semi-finals and beat them after Saints had clinched the League Leaders' Shield. Shaun Wane's Wigan stand in Warrington's way, a side who have now made five finals in the last six years - 2013 and 2016 saw victory, 2014 and 2015 defeat. "I think most people would have seen St Helens as big favourites for that game [semi-final] but you have to give credit to Warrington. They played really well on the night and took an opportunity at the end. "I knew it would be a close game but I wasn't surprised in the sense that Warrington did have the ability to win, but I was probably disappointed that St Helens didn't make it - still being a fan of theirs and an ex-player. "The final is a difficult task. They are two teams that are highly motivated and there are a lot of sub-plots going on as well. "Warrington have obviously been chasing this for a number of years and been very close. On the other hand, you have Wigan where the head coach [Wane] is moving on to pastures new and some payers are moving on too so there's a lot of stuff like that which is going on in the background which is just going to add to the occasion. "It's anyone's game. There are so many variables which will determine the outcome and it's good to see two teams that are defensively strong. 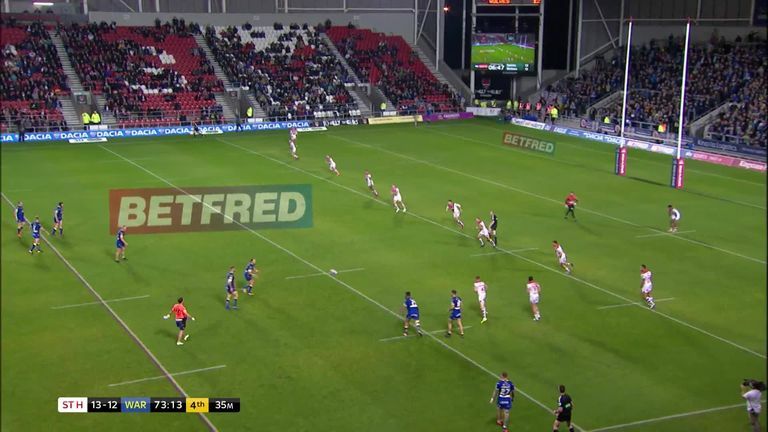 Warrington conceded one try against St Helens and Wigan obviously didn't concede a point, so it's going to be another tight game on Saturday." The Grand Final is the showpiece event of the Super League season. A crackling atmosphere, deafening noise. It's a bucket list event for even non-rugby league supporters. What is the occasion like from a players' perspective? "It's something that is quite difficult to put into words. It's very different from anything else you experience in the year or throughout the week-to-week games you have. There's only really the Challenge Cup that can sort of replicate the Grand Final. "Walking out of the tunnel side by side, the hooters, the fans cheering, it's a bit overwhelming. "But most of the lads who are playing on Saturday would have experienced it before, they've just got to try and go out there and block that out. Because once that first ball is kicked off, it's just a bit of grass. A field anywhere. "When you first walk out, that's when it hits you. That surge of emotion starts pumping through your veins." And in 2008, Graham went further by scoring a try in the Grand Final - albeit in defeat. A special memory nonetheless. "It's quite weird actually. I think it was the first try of the game as well if memory serves me right. "Someone showed me a video of it the other day and I was thinking: 'What am I doing backing up through the middle?! ', it's probably something that doesn't happen anymore. "Scoring a try in a Grand Final, it's one of them as a forward that it's not something I was thinking about doing going into the game, if that makes sense. It kind of just happened. I'm sure the wingers, full-backs and centres might think about getting over the line but for me it was kind of: 'Well what's happened here like?'" This weekend, Graham will be on Sky Sports duty alongside our usual team of Brian Carney, Barrie McDermott, Terry O'Connor, Phil Clarke, Jon Wells and Eddie Hemmings who will be calling his 21st Grand Final from 21 starts. The forward envisions a more hands-on role within the sport in the future beyond his playing days though. "I am looking forward to it. I've done a little bit of stuff in Australia but this will be the first time over here, so it should be good," he said. "It's creeping up on me soon. I'm getting to the point where I won't be able to compete and play anymore. I'm starting to look into certain avenues after this part of my life is over in terms of playing. "The coaching avenue is something that really appeals to me. Rugby league has given me everything, so to stay within the game is the logical choice. "Hopefully I can look at doing something along that pathway."